Registered members get 1.00€ off! Not a member? Sign up now! All donations will be reinvested into server maintenance costs and hardware. Get a tag in front of your username to show that you support us. /remove You will be able to remove all tiers of your base construction and get a partial refund of the original material cost. You can also remove deployables such as workbenches, chests, external high walls and doors with full 1 to 1 refund. No more headache from misplacing walls. No more wasting of explosives just to get rid of mistakes! Ever felt like every chest you have in your base is a complete mess? Not anymore! Sort loot with one click using the Quick Sort menu that conveniently appears above whatever lootcontainer you are using at the moment. Sweeet! 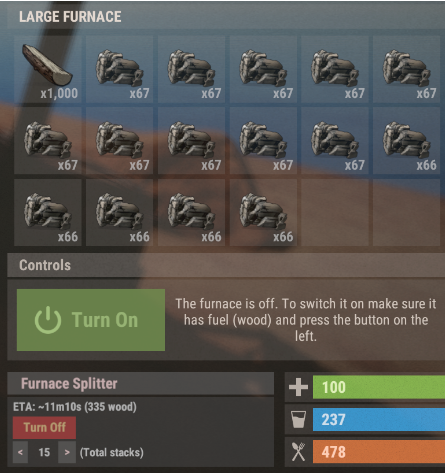 Furnace Splitter will allow you to automatically split stacks evenly in all furnaces, campfires, refineries etc. automatically. The size of the stack is configurable. You can see how much of the resource you need until they have been used up. You can see (ETA) Estimated Time until it is done. A simple to use menu will appear at the bottom that shows all options available. Extremely convenient.  When you die or get killed by something you will get a private message in the chat that contains the coordinates where you died. Looking for your body is a thousand times easier, maybe you will even be able to retrieve your items before someone else loots your body? Type the command /where as you move around and it will indicate how many far and in what direction your body is. You will be able to remove all tiers of your base construction and get a partial refund of the original material cost. 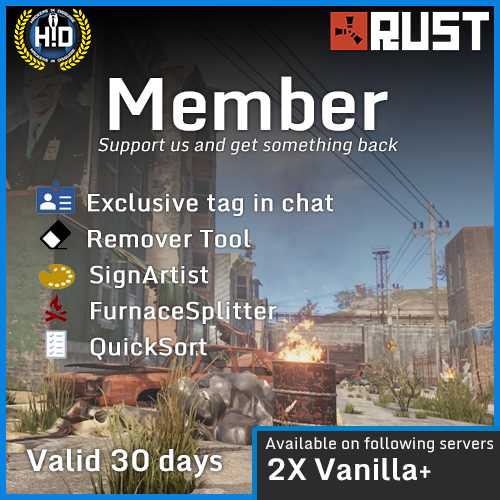 You can also remove deployables such as workbenches, chests, external high walls and doors with full 1 to 1 refund. No more headache from misplacing walls. No more wasting of explosives just to get rid of mistakes!